Until recently, Fengtai was mostly rural. Large parts of the area had no electricity, but lots of pig and goat pens. In the mid-1980s, the district began urbanizing. Now mostly an industrial area, Fengtai has several high-rise and mid-rise apartment buildings close to its factories. 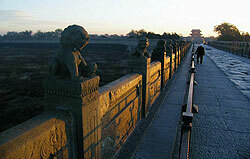 Its most important landmark is the Marco Polo Bridge. Also known as the Lugou Bridge, this structure is where the war of resistance against Japan began in 1937. While the bridge still stands today as a historical monument, it is also an architectural masterpiece made completely out of granite, with hundreds of intricately carved lions. Those who find themselves in this district may fancy a stop by the Yangtai Sports Centre, which recently held the Olympic softball games.